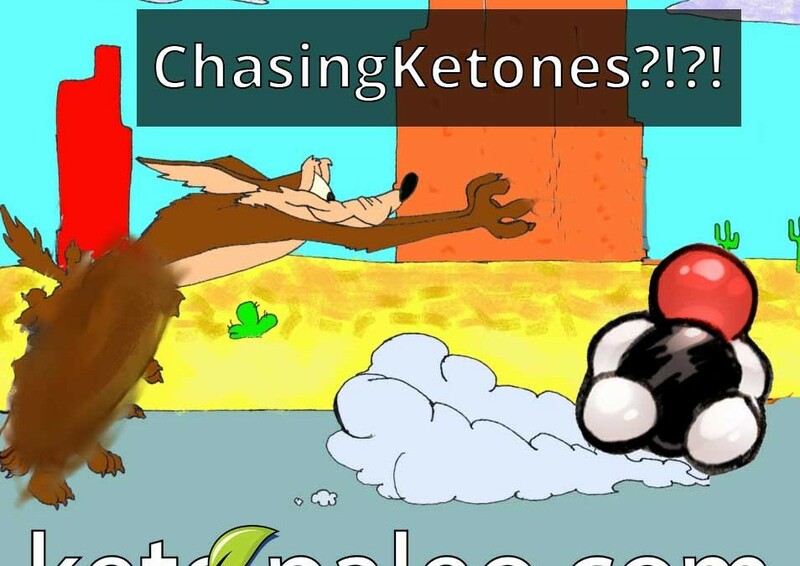 Chasing Ketones! Is it necessary? Is it worth the effort? Why would you want to? Why Bother? What’s the best way to do it? Although this post may not answer all those questions, it may in fact raise more. 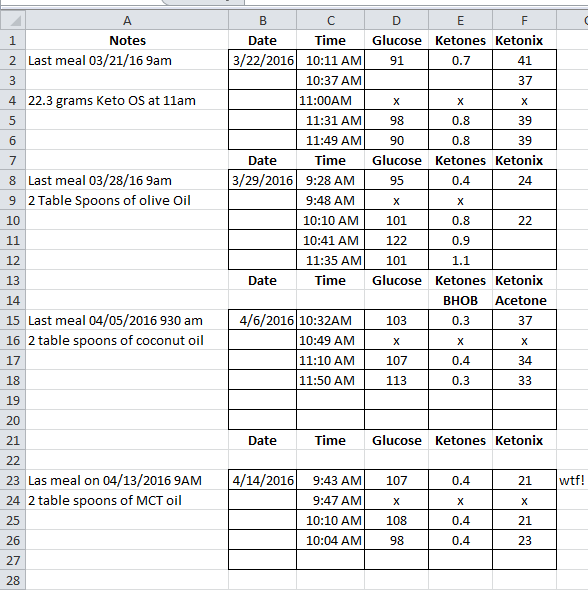 What I was curious to see is if ingesting different forms of oils (coconut, mct, olive) as well as exogenous ketones would actually make a difference in my levels of Blood Sugar, blood level ketones Betahydroxybuterate and breath level Acetone. Interesting is what I found! So what we did at Keto Paleo labs (aka me) did was water fast for 24hrs or a little more. Still worked out and trained on those days. Took some readings: Empty stomach, take dosage, take reading at 20 minutess then reading at 1 hour. As you can see that nothing really gave me a big increase at all except maybe good ol’ Olive Oil. Now there are some important notes to make here that I think may have effected the sugar and ketone readings. I worked out hard the night before my readings all 4 times. Liver may have dumped it’s glucose and left me a little higher than normal than the days I don’t train. But, that’s rare, I always train/workout. On the days I’d start the experiment, I’d pretty much wake up, test, take dosage, sit and my desk and work for that hour pretty sedentary. My thoughts were low acetone as I wasn’t burning much fat as I wasn’t moving so I didn’t need the energy. BHOB was low for the same reason and the doses I took was not high enough to show at a blood level. I also often question when we try to circumvent certain pathways by adding something to create what seems to be what our goal is. What other elements of that process are we side stepping? If I add exogenous ketones verse my body following the normal pathway. What am I not making? Is there another essential element to that process that may or may not be on the radar? Similar to taking Vitamin D orally. There are up 13 other photo nutrients your body makes for that process of the sun and our skin. There may be therapeutic levels of Ketones that may need to be reached for some individuals with metabolic health conditions and that I think is yet to be solidified. Also taking readings when you are trying to trouble shoot issues you may be having loosing weight etc. But if you are achieving your goals, let your body do it’s job and utilize this very natural metabolic pathway to make you lead a Happy Healthy Life. If anyone has suggestions on other things to test, try differently or ideas. 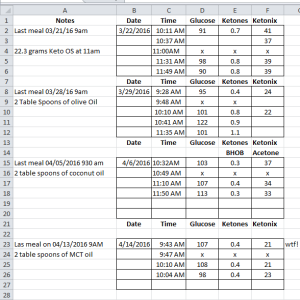 What I’d like to do with the data Is establish a ketogenic index much like they glycemic index. Thanks Jamie! Interesting info. I’m 45 and also CrossFit, I’ve found that when I’m more consistent with training I hover higher on glucose and a little lower on ketones, pretty consistent above 0.5, occasional 0.4’s (blood & breath). I’m usually in the 10-15 carb g daily, always under 20. I feel great. Strength and endurance arealways gaining. I’m very data driven and I think that makes me “keto paranoid” though, I still check daily. Thanks for your work and the site. Just recently found you through Andreas Eenfeldts site. Thanks for Writing in! I have a seminar on Aug 27th at the University of Michigan. I hope to periscope it. Hopefully you can catch it!